On a particularly hot day, or when you’re thinking of supplementing your breast milk or formula, you might be tempted to give your baby water. The fact is, it’s generally not a good idea to give a baby water before 6 months of age. Until this point, they’ll be fine and get more than enough nutrients and hydration on a hot day from either breast milk or formula. In fact, breast milk itself is 88% water. Even on a hot day, your baby won’t need any additional water, as long as you allow them to breastfeed as needed. Studies have shown that even in extremely hot climates, babies get all of the required water just from breastfeeding. Just make sure that you stay properly hydrated! The main reasons not to are: it will quickly fill them up, and water doesn’t contain any of the vital nutrients supplied by milk or formula. Doctors also warn that too much water can quickly drain a baby’s tiny kidneys out, depriving them of much-needed sodium and electrolytes. 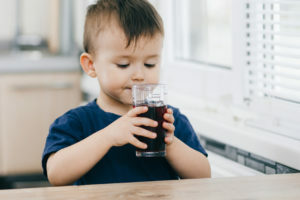 Now, while small sips of water probably aren’t going to cause any harm, it’s best to check with your pediatrician before doing so. What about when it comes to formula? Adding too much water to formula can not only cause the same water intoxication, but your child won’t be getting enough vitamins and nutrients. Don’t try to stretch out the formula with more water than the directions suggest. Juice has the same negative effects as water; filling them up, etc but the heavy concentration of sugar is also bad for a tiny baby’s tummy. It can cause both stomach cramping and diarrhea in a young infant. When Can You Safely Give Your Baby Water? Most experts agree that it’s safe to introduce your baby to water after they’ve started eating solids. This will be roughly around 6 months of age. This is especially easier to accomplish when they’re old enough to start to drink on their own from a sippy cup. Feel free to give them small sips of water, but make sure not to overdo it, because it can give them a tummy ache, or make them too full to eat. After their first birthday, they’ll be well into eating solids and whole milk, and you’ll likely be fine to give them as much water as you want! When Can I Give Them Juice? Like water, you can start introducing them to juice when they start eating solids. However, make sure that it’s only 100% fruit juice, and try to avoid anything with added sugar. Only offer it to them in a cup, not a bottle, as this will help prevent tooth decay. You should also limit the juice intake to 4 oz per day, and only give it with a meal or snack. The reason is that juice can fill them up quickly, depriving them of important nutrients. It can also cause weight gain, diarrhea and diaper rash. Want to get them drinking from a cup? Get one that doesn’t have a valve; this is easiest for them to practice and learn to use. Get one of a decent size (5oz will do) and fill it up to the very top so they don’t have to tilt their heads back far.